In the past, many financial advisors, investors, and brokers did not spend much time focusing on asset allocation and instead dedicated their time to selling products and security selection. However, asset allocation is being utilized today by more financial advisors than ever before. To help financial advisors and investors, we put together a guide that will hopefully provide advisors with a clearer understanding of what asset allocation is so that they can incorporate it into their financial practices. Will strategic or tactical allocation be practiced? What will be owned and why? What won’t be owned and why? Which asset classes and strategies will be used? When will changes be made and why? How will a plan be implemented and who much maintenance will be needed? To gain exposure, which types of securities or funds will be used? If the perfect asset allocation existed, advisors wouldn’t have the need to explain to their clients which classes they are putting them into and why. However, since there is no perfect allocation, it is essential for financial advisors to be able to explain to their clients which types of investments they will be put into and the reasoning for it. Clients who don’t understand why their own certain investments or how they work will be less likely to stay with a financial advisor. One of the most underrated responsibilities of a financial advisor is to be able to simplify complex topics to clients, and asset allocation is considered one of those topics. Understand that continuous education is essential. What’s the most effective way to explain the investment philosophy and strategies? Does the client understand their investments enough to educate them? Can a client’s portfolio allocation be simplified enough so that they can understand? What’s the communication plan going forward to ensure clients stick around long enough? What are the right risks to prepare for? What is the best way to attain specific asset classes or risk factors? What is a reasonable cost to pay for these classes and risk factors? What is an efficient way to balance client ‘s short-term sanity with their long-term goals? There are distractions from other advisers and investors, the markets, and investment products. In strong and severe bull markets, long-term policies tend to get pitched. Advisors who greater good allocation policies and follow through on them will increase their chances of success significantly, but it is easier said than done. And, it can be even more challenging when you are handling other people’s money and investments. It is important that advisors have good reason to make changes to a detailed allocation policy on behalf of their clients and understand that all clients won’t fit into the same allocation mix. Lastly, both advisors and clients should realize that the best asset allocation in the one that is stuck with long-term. Hopefully this post helps advisors grasp a better understanding of asset allocation. 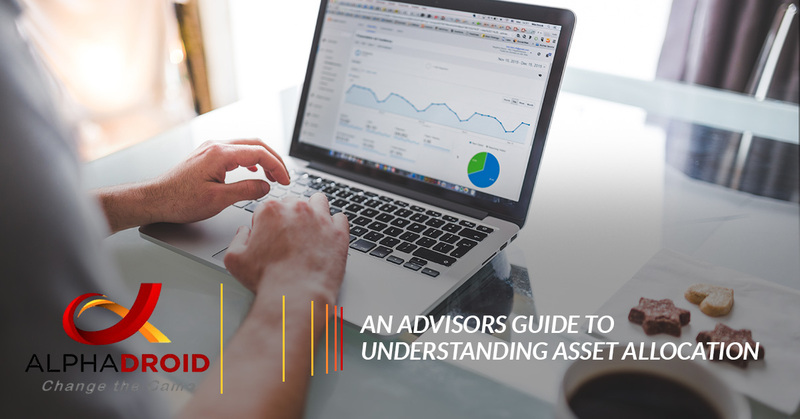 Understanding the in’s and out’s of asset allocation, as well as being able to explain it to clients in a simplified way, is essential to the success of an advising practice. It is important for advisors to explain to clients that asset allocation is how you manage money, without knowing what the future markets will hold. Effective asset allocation can allow advisors to generate strong gains, long-term while reducing the amount of risk in the future. While asset allocation can be a challenge for some advisors, it doesn’t have to be! By using asset allocation software, risk and working through a volatile market has never been more manageable. AlphaDroid uses sector momentum measurements to help financial advisors identify which portions of the market are likely to outperform. AlphaDroid’s financial planning tools consist of a selection of up to 12 ticker symbols with a few trading rules, crash protection options, and performance testing options. With AlphaDroid, the tiresome selection of most algorithmic parameters are fully automated, allowing advisors to focus more on asset classes and strategies. Interested in trying AlphaDroid’s elite investment portfolio management tools? Start your free software trial today!